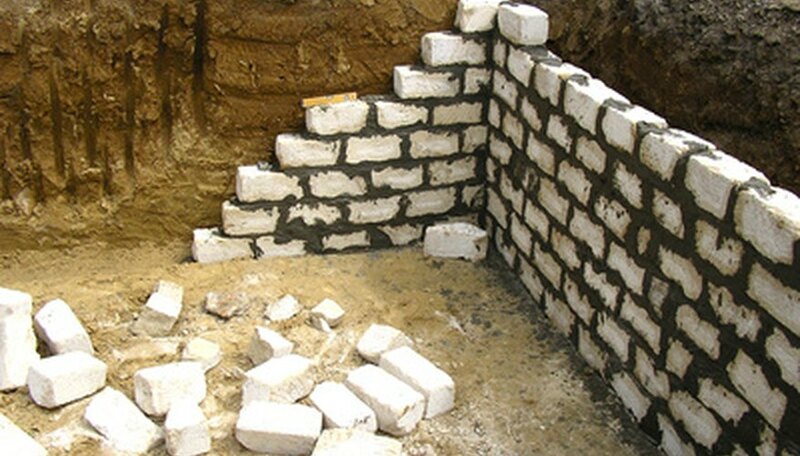 Poured wall and block are two of the most common basement designs. For a poured wall basement, a contractor pours concrete into the foundation framing to create a basement wall. With the block basement design, the homeowner buys pre-poured blocks of concrete and stacks and them to build the walls. The cost of the raw materials is roughly the same for poured wall and block basements. The basic components are small gravel, cement mix and sand. Poured wall basements require a larger expenditure for labor, as most homeowners must hire a professional to measure, mix and pour the concrete into the basement area. With the block basement, do-it-yourselfers are able to do the building themselves. When a poured wall is poured and set, there is no additional work to be done, and no extra materials are needed. For a block basement, mortaring is necessary. Thus, mortar and hand tools must be purchased in addition to the to the raw materials. Poured walls are less likely to allow water into the basement. Though only external waterproofing can prevent water from entering, poured walls don't have the cracks that block basements do. Block basements, on the other hand, tend to hold in heat and cold well, which saves on energy costs.